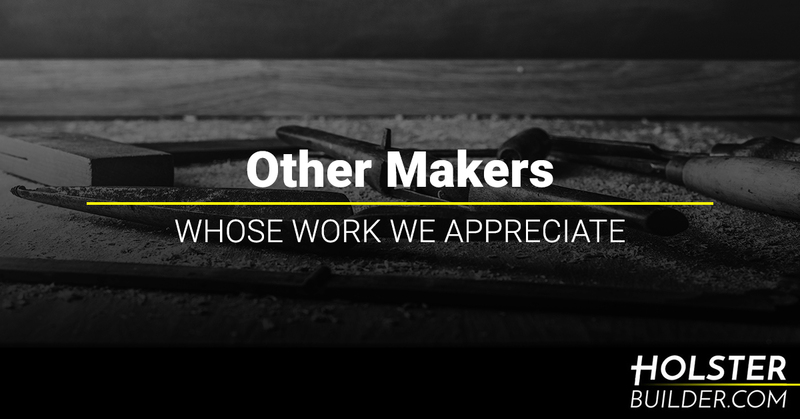 Here at Holster Builder, we appreciate good, old fashioned hard work. It’s part of the reason that we’re proud to offer holster making supplies for people. As you probably know, we started off as shooters, then we started making our own holsters, and now we want to help you do the same. There’s something about the art of making an item that’s special. Perhaps it’s because we live in a day and age where everything is mass produced overseas and disposed of when it first starts to wear out. Frankly, that’s a little depressing. We’re doing our part to change that mentality and we’re committed to supplying holster builders with everything they need to succeed. So where do we get our inspiration? It can come from anywhere, but in today’s post, we’d like to highlight some people in the maker community who are doing truly exceptional work. If you’d like to be inspired by people who are pushing their talents to the limits and forging new paths, today’s post is for you. Keep reading to learn more! If you want to be inspired by the sheer amount of different things a person can make, look no further than Jimmy DiResta. A staple of the maker community for a number of years now, Jimmy’s YouTube channel is full of great examples of what he’s capable of. From chicken coops to padlocks to giant razor blades to dining tables to doghouses to leather backpacks, Jimmy has handmade quite a bit over the years. No challenge is too big, as Jimmy has recently undertaken the restoration of a printing press from the 1800s as well as the construction of a canoe. His website allows you to purchase some of his creations ranging from ice picks to push sticks for table saws to letterpress posters from his printing press. He even hosts classes at his home in upstate New York on subjects like welding, blacksmithing, knife making, and more. In short, if you’re looking for inspiration, Jimmy DiResta is the person to turn to. Is there anything the man can’t make? We’d wager that no, there is not. If you’re the type of person who appreciates insight into a creative person’s design process, you’ll absolutely love Chris Salomone. His craft is primarily woodworking, and each of the videos he makes offer a look at his thought process when creating. He’s also really great at showing his mistakes as well as the solutions he came up with to overcome them. At the end of the day, every person who makes something is going to make mistakes, so having an inside look into the problem solving process is a wonderful thing. Chris isn’t afraid to try new things, as is evidenced by a recent video in which he makes a waterfall table out of walnut, routes out a space, and fills it with melted crayons. Trust us when we say that you’ve never seen anything quite like it. His YouTube channel also highlights builds including a scrap wood coffee table, nightstands with built-in wireless charging, a concrete and wood side table, a media console, hanging modular planters for succulents, a headboard, and more. Her YouTube channel is full of “woodworking, blacksmithing, welding and fabrication, DIY projects, organic farming and gardening, cute animals, food, [and] happiness.” We’re talking, of course, about Anne of All Trades — and trust us when we say that her name is super appropriate. Anne lives in Washington State, and the life she lives on her farm is incredibly interesting. The videos she shares include everything from learning about 3D printing to beekeeping to forging her own tools to building a tiny house in her backyard for her mom to stay in while she’s visiting. One of the best qualities of Anne’s work is that she’s so thoughtful about the process of sharing. Her videos are always personable and even if you don’t have the skills that she does, they’re enjoyable to watch. Anne’s passion for what she does is tangible, and coming away inspired is pretty much a guarantee. We are fortunate to be able to live in a time when finding people who are passionate about making cool things is easier than ever. Rather than having to become an apprentice and study a craft for years, you can pull up the information you need on YouTube and try a project in your free time. Perhaps one of the things you’re interested in building is holsters. If that’s the case, you’re in the right spot. We’re proud to offer everything you need to make your own holsters whether your goal is to make one for yourself or start your own business. Shop our entire selection of holster making supplies today!